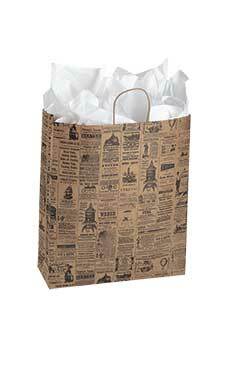 Our newsprint Kraft paper shopping bags will set your retail packaging apart from the rest. The newsprint bag features black printed early American advertising reproductions that will surely add a spark of nostalgia. This size is a great choice for small to medium sized items like t-shirts and periodicals. Our Kraft bags are available in 3 sizes which allow them to be an economical way to provide packaging solutions for all types of general merchandise.